We have designed a beautiful cat house for that one special cat…or multiple cats. Engineered for cat comfort, the Cool Cat Cottage comes already insulated, with 9 inch lounging ledges that wrap around two walls. The upper level has two real glass lookout windows and an escape/exit door. 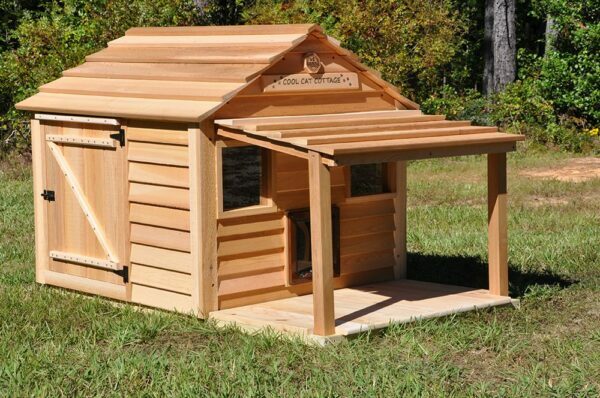 Blythe Wood Works has designed a beautiful cat house for that one special cat…or multiple cats. Not only is it engineered for cat comfort, this house is very easy for the cat owner to assemble. The Cool Cat Cottage comes already insulated. Standard, at no extra charge, are 9 inch lounging ledges that wrap around two walls. The upper level has two real glass lookout windows and an escape/exit door. The many available options make it possible for the customer to customize the Cool Cat Cottage to fit the needs their cat(s) may require. We offer remote control air conditioner, one or two cat heat pads, larger multiple cat heat pads, porch and deck systems, raised foundation with 12 inch tall support legs and magnetic seal safe doors. We know the Cool Cat Cottage is cool, but what we really want you to know is that we build pet houses like no one else in the business…..kind of like the way your grandfather would have built it. We use real 2 x 2 framing with diagonal wind bracing. We use stainless steel nails and the screws are ACQ Powder Coated; therefore there is no chance of rust or black runs on the clear western read cedar siding. These houses are built to last a long time which is your assurance of real American made value.